When kids are working on handwriting tasks, they sometimes show difficulties with attention, focus, or legibility due to heavy pencil pressure, tearing of paper, or smudged pencil lines. Kids may have sensory needs while sitting at a desk as they are required to attend, or they might have typically developed sensory systems and show typical signs of fidgeting during classroom work. 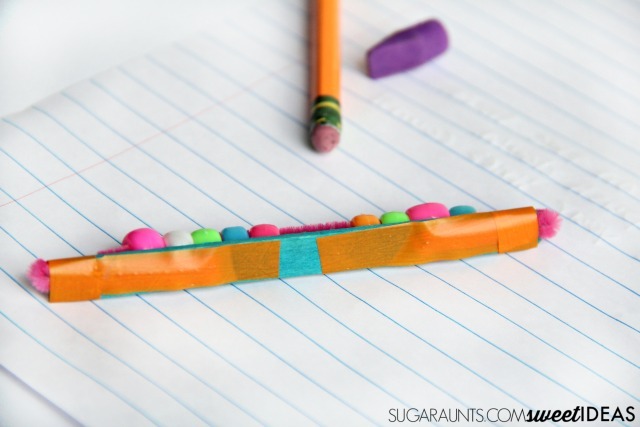 Whether your child/student/OT client has sensory needs or not, a fidget tool is often times just the key for helping with extra wiggles and movement needs that are interfering with handwriting and thus learning in the classroom. 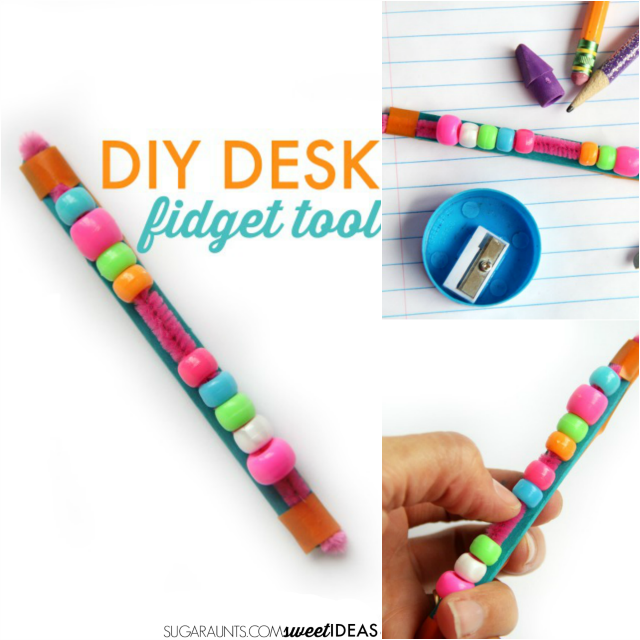 This DIY fidget tool is perfect for the desk because of it's small, discrete size can be stored right inside the desk or even in a pencil box. 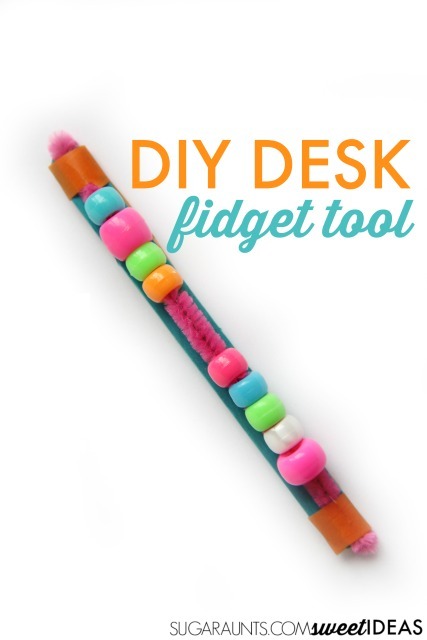 Kids can place this on their desk top as a fidget tool to use while handwriting. There are many indications that a child shows a need for a sensory tool like a fidget while writing. Read more about proprioception and handwriting here. This attention tool is just one idea that might help in the classroom or at home. Here are more DIY fidget toy ideas that you might like. Fidget toys are a great tool for addressing sensory needs, attention and focus during tasks. We've shared a sensory tools for helping with fidget needs during homework and this tool would be a great addition to the homework time. Cut a pipe cleaner to fit the length of a craft stick, including bending both ends over to the reverse side of the craft stick. 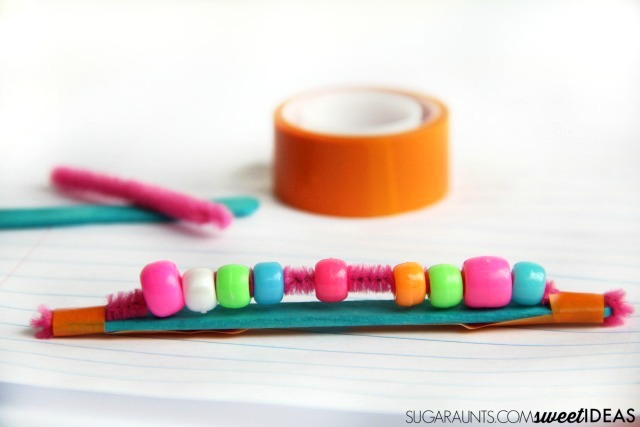 Slide several beads onto the pipe cleaner. Then, bend both ends over the ends of the stick. Attach them with a strip of tape over the length of the pipe cleaner that is bent down the backside of the craft stick. At this point, you can wrap rubber bands around each end of the craft stick to secure the pipe cleaner. You will want to cover the rubber bands (or just tape around the end of the craft stick if you omitted the rubber bands). 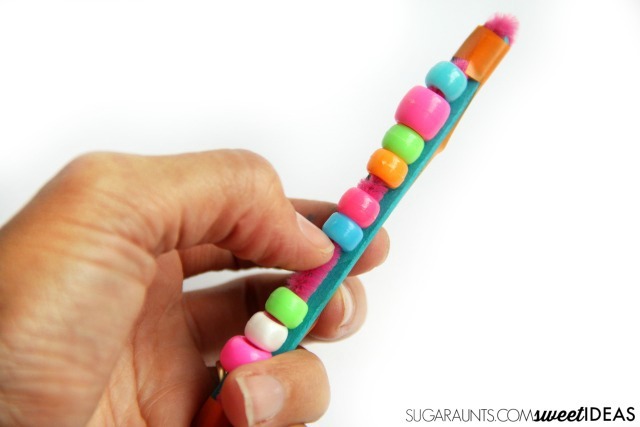 Use the fidget toy to help with attention and movement needs by sliding the beads up and down the pipe cleaner while writing, copying written work, reading, or listening in the classroom. The small size and flat back of this fidget tool make it perfect to rest on the desktop surface. The child that is writing can hold it with their non-dominant hand as they stabilize the paper when writing with their dominant hand. A ball of play dough or this Pull and Stretch Bounce Ball is a good way to keep kids' hand occupied as they move with the small motor proprioceptive input. This heavy work for the hands can allow kids to concentrate as they write. The DESK BUDDY is great for kids who are doing homework as it can sit on a table surface or it can be a hand-held sensory fidget toy. 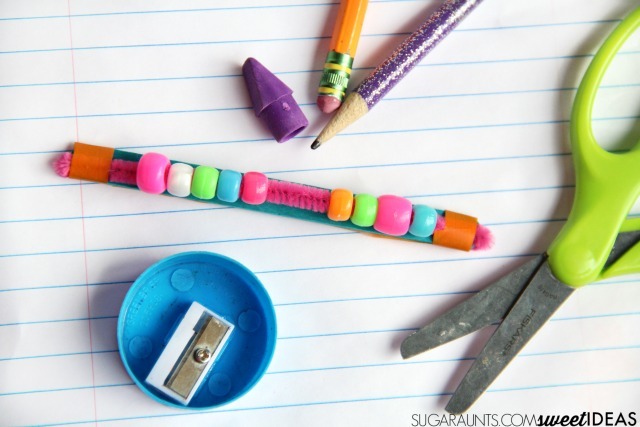 A pencil topper like these Pencil Tops Fidget can help kids while they write, and can be fidgeted with on or off the pencil. Try writing with a vibrating pen like this Squiggle Wiggle Writer for proprioceptive input before a writing homework assignment. THE ULTIMATE FIDGET is a quiet fidget toy that kids can keep in their pocket. Something as simple as nuts, bolts, and washers can make a great fidget toy for kids. 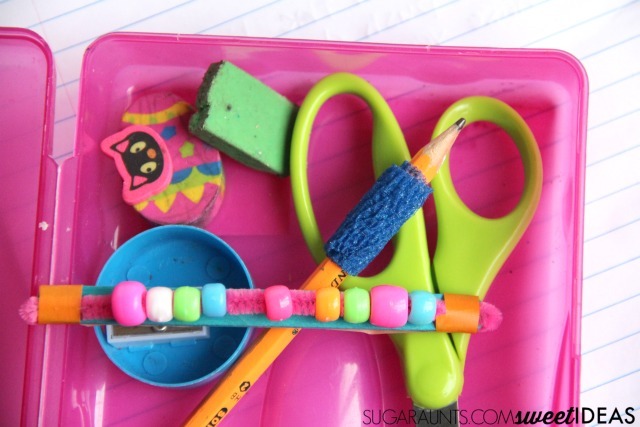 A few Wikki Stix can give a child just the fidget toy they need to concentrate. Kids can bend them into a ball, and work the bendable strings as they work. Grip Pop Beads are one of my favorite fidget toys for kids. They work on the small muscles of their hands as they build the pop beads and have a fidget once they have a strand of beads. Be sure to check out all of the easy handwriting tips in this month's series and stop back often to see them all. You'll also want to join the Sweet Ideas for Handwriting Practice Facebook group for more handwriting tips and tools. Get 29 pages of modified paper with a Christmas Theme for legible and neat Letters to Santa, Christmas Wish Lists, Thank You Notes, Holiday Lists, and MORE! 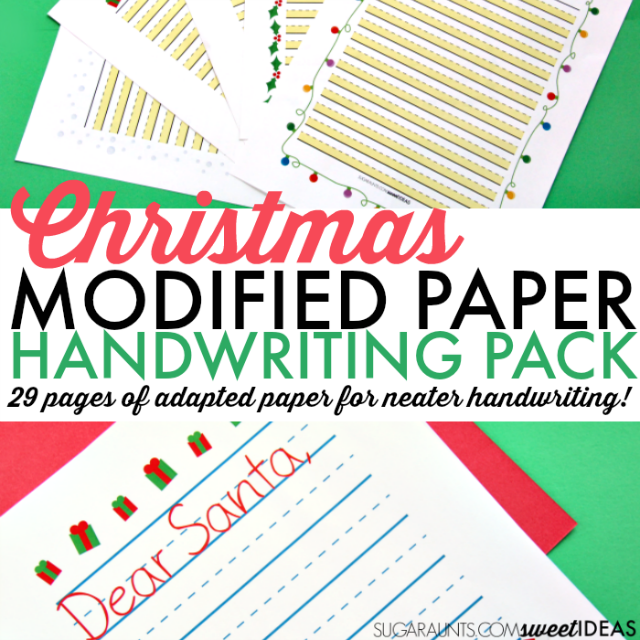 GET YOUR Christmas Handwriting Pack!